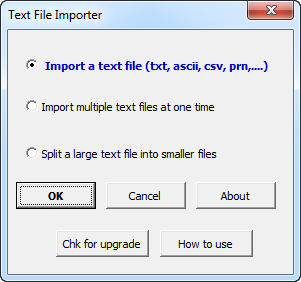 The Text File Importer add-in for Microsoft Excel can quickly and easily import text files (CSV TXT PRN ASCII ....) containing over one million rows of data into Microsoft Excel. And, the Excel Import Wizard does not pop-up with the file is imported! It is compatible with Microsoft Excel 2007 to 2019 and Office 365. One of our customers discovered when he manually opened CSV files that the credit card numbers (12 digit numbers) had the last digit changed from its actual number (1, 2, 3...) to a zero by Excel! With the Text File Importer, he was able to open the CSV file without it being automatically converted to columns. He could then specify that the credit card number was a text entry, and the zero was not dropped!